Storage Control Systems, Inc. has been at the forefront of the controlled atmosphere industry since their establishment in 1982. The company has proven to be a leader in North America for supplying atmosphere modifying equipment including nitrogen generators, CO2 scrubbers, gas analyzers, temperature control & monitoring equipment, as well as a specialty cold storage warehousing design/build firm. “We said, let’s take a lab cabinet, put a valve on it that can share or isolate (from the larger room), put in the respiration quotient system and let the apple talk to us." "Pomesters name Schaefer Fruit Man of the Year"
“Michigan Pomesters recently named Jim Schaefer its 2016 Fruit Man of the Year. Schaefer, owner and president of Storage Control Systems (SCS) in Sparta . . . "
"Precision agriculture took center stage once again when the International Fruit Tree Association held its 59th Annual Conference Feb. 6-12, 2016, in Grand Rapids, Michigan. " "Thome Orchards is a six-generation apple orchard located a few miles north of Grand Rapids, Michigan in a farming region known for apple production called Fruit Ridge. " "The Future of Fruit Storage"
"Jim Schaefer, president of Storage Control Systems, talks about what he believes is the future of fruit storage." “ . . . David considers that there are opportunities to improve with 'intelligent atmosphere contol'. He outlined an entirely new way to test the store atmosphere, the Safepd. This patented system involves a small chamber containing representative samples . 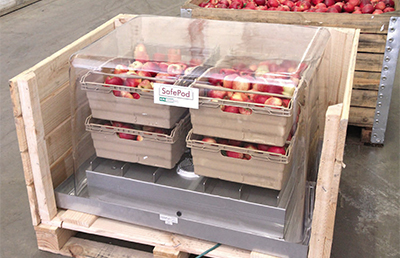 . . "
"BIFGA AGM and Farm Walk 2015"
"Storage Control Systems wins UK grant to study SafePod technology"
“Fruit growers are people persons,” said Schaefer, president of SCS. “They want to make sure that you’re for real and that you’re going to be able to service them when they have problems. “With fruit growers, it’s about family,” he continued. “They run family farms, so we end up knowing the owner, the owner’s son and the owner’s son’s son. That’s really what Storage Control. . . .
""Breeding, energy, shelf life will drive future of storage""
Randy Beaudry, a horticulture professor at Michigan State University, said storage technology has pushed fruit about as hard as it can be pushed. If there’s going to be another “sea change” – like there was 60 years ago, when the industry shifted from refrigeration to controlled atmosphere (CA) – the crops themselves will . . . .
"Research Funding Secured for Storage Pod"
The "Dynamic CA" process could potentially fine-tune the current controlled atmosphere system, which sees each cultivar have its own generic storage programme. Although these programmes deliver good-quality produce at the end of the fruit storage period, they cannot take into account factors such as the natural variability of the growing season or orchard nutrition and location. Some tweaking is possible but, without precise analysis and control, optimal conditions are never established. "New Cools of the Trade"
These systems are said to be safer to operate, easier to defrost, less complicated and less expensive to maintain, and they keep fruit in better condition with less shrinkage. One big advantage is getting rid of ammonia inside storages, where leaks can damage fruit and endanger the lives of workers. Ammonia is . . . .
"New Dynamic CA Control System a Big Hit in Berlin"
This is where SafePod comes in – a system delivering regular checks on the fruit condition through the analysis of enclosed samples of fruit exposed to a more extreme regime thus providing a safety threshold for the whole store. This process is called “Dynamic CA”. . . .